#JohnRippon (1751-1836) was born in Tiverton, in Devon, educated in Bristol at the Baptist College, and became pastor of the Baptist Church in Carter Lane, Tooley Street in London (later removed to New Park Street) at the age of 22. He ministered there until is death. John Rippon appeared on the church scene at a low point. For Watts and Doddridge had passed and so had Wesley while those such as Booth, Fuller, Ryland, Foster and Hall were but at the beginning of their ministries. This lack of influential religious and denominational leaders was mirrored in the field of hymn writing. Into this void stepped John Rippon, who is best known for ‘A selection of Hymns from the best authors intended as an Appendix to Dr. Watts’s Psalms and Hymns’. It was published in 1787. It has been suggested that denominational hymnals were unknown of until Josiah Conder in 1836 (Congregational Hymn Book) but this would forego Wesley’s ‘Collection of Hymns for the use of the People called Methodists’, the ‘Bristol Hymn Book’ 1769, as well as several private collections based solely on Watts’s hymns 1755. Although Rippon was an author and fine musician (he composed an oratorio), he felt the need for professional assistance in the compiling of his tune book. This work fell to #ThomasWalker (1764-1827). Walker was an alto from London and composer. He also wrote the preface to the tune book. The tune book was published in 1791 – just four years after the publishing of the hymn book. 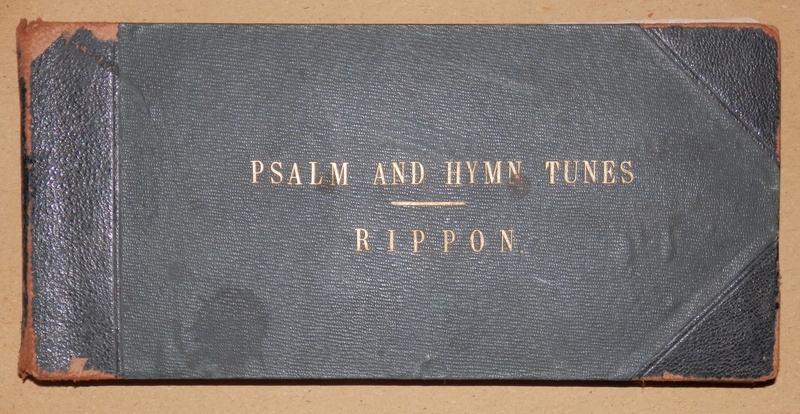 As with the ‘Olney Hymns’ in an earlier chapter – Rippon’s psalm and hymn book contained lyrics only. It might have been Ripp0n’s intent to publish a tune book to coincide with his hymn book. Even if not the sale of both books brought him notoriety and prosperity. The images are of my copy of John Rippon’s Tune Book. I am afraid I cannot tell you which edition it is for I miss a few pages at the beginning ( I think 7th edition – I have looked thru all the pages and can find year date watermarks for only 1809 and 1810). My first page is as seen above. It is Thomas Walker’s preface and intro to psalmody. I also miss two pages containing tune numbers 88 to 95. There are also a couple of pages missing from the index of tunes at the end of the book. I must agree with book aficionados for the paper quality is poor and the printing quality at times abysmal. But even with all that, I am enjoying singing my way through the book. This entry was posted in Printing, Writing/Books and tagged book, chant, hymn, John Rippon, paper, psalm, tune. Bookmark the permalink.